The European Film Festival is back for the 4th time at Cinema Nouveau theatres in Johannesburg, Cape Town, Pretoria and Durban from 5 to 14 May. The lineup of films represents 12 countries, including Ireland and Croatia for the first time. Each film reflects the skills and take on the world of filmmakers who are not limited by national borders. American Honey, an award-winning British-made road movie set in America’s mid-west, is as much a magical mystery tour into Americana as it is a coming-of-age drama. King of the Belgians is a comedic piece coming out of Belgium, which sees the Belgian king and his entourage crossing the Balkans in a madcap adventure, after learning of a coup back home. Acknowledged by the Rotterdam International Film Festival, this movie is a road trip with a difference, at once thoughtful, hilarious and wild. Strike a Pose is a Dutch documentary exploration of “Madonna’s men”, the male dancers who served to consolidate the pop icon’s message and status as an outspoken advocate for LGBT-rights. This winner of a jury award at the Key West Film Festival is an unrelenting documentary which exposes new aspects of a well-known story. Germany’s Toni Erdmann is the outlandish tale of how the passing of a family dog sets off a series of events with a major impact on a father-daughter relationship. Touted as an academy award winner for best foreign film in 2017, this is a must see, by all accounts. The 2017 selection is a mixed pot in terms of film themes which span from animal rights to family dynamics. Dramas and documentaries, comedies, tales of grief and a children’s adventure sit side by side on this eclectic and exciting programme. “The films are new, but the commitment remains the same: to offer audiences in South Africa an opportunity to experience acclaimed and award-winning European cinema”, adds Hedrén. “European filmmaking has seen another year of highly creative output, and filmmakers continue to produce works that challenge and uproot. We are happy that Festival Director Katarina Hedrén’s 2017 film selection has given even more variety to the European Film Festival.”, says Norbert Spitz, Director of the Goethe-Institut, on behalf of the European partners. The European Film Festival is coordinated by the Goethe-Institut South Africa, hosted by Ster-Kinekor Cinema Nouveau, and organised in partnership with the Delegation of the European Union to South Africa and 12 other European cultural agencies or embassies in South Africa: the General Representation of the Government of Flanders, the French Institute, the Italian Cultural Institute, the Camões Institute, the British Council, and the Embassies of Austria, Belgium, Croatia, Ireland, the Netherlands, Poland and Spain. The European Film Festival is part of the EuropeFest, presenting in South Africa in May 2017 a diverse range of EU Member States cultural events. Stefan Zweig: Farewell To Europe (Austria), drama, directed by Maria Schrader and starring Tómas Lemarquis, Barbara Sukowa and Josef Hader. German, English, Portuguese, French and Spanish with English subtitles. 106min (2016). King Of The Belgians (Belgium), comedy, directed by Peter Brosens and Jessica Woodworth and starring Peter Van den Begin, Lucie Debay, Bruno Georis and Pieter van der Houwen. Flemish, French, English and Bulgarian with English subtitles. 94min (2016). The High Sun (Croatia), drama, directed by Dalibor Matanic and starring Tihana Lazovic, Goran Markovic and Nives Ivankovic. Croatian with English subtitles. 123min (2015). Things To Come (France), drama, directed by Mia Hansen-Love and starring Isabelle Huppert, André Marcon and Roman Kolinka. French, German and English with English subtitles. 102min (2016). Toni Erdmann (Germany), drama, directed by Maren Ade and starring Sandra Hüller, Peter Simonischek and Michael Wittenborn. German with English subtitles. 162min (2016). The Queen Of Ireland (Ireland), documentary, directed by Conor Horgan and starring Declan Buckley, Phillip McMahon and Una Mullally. English. 86 min (2015). Sweet Dreams (Italy), drama, directed by Marco Bellocchio and starring Bérénice Bejo, Valerio Mastandrea and Fabrizio Gifuni. Italian with English subtitles. 134min (2016). Strike A Pose (Netherlands), documentary, directed by Ester Gould and Reijer Zwaan and starring Luis Camacho, Oliver S. Crumes III, Salim Gauwloos, Jose Gutierez, Kevin Stea, Carlton Wilborn and Gabriel Trupin. English. 83min (2016). Spoor (Poland), drama, directed by Agnieszka Holland and Kasia Adamik and starring Agnieszka Mandat-Grabka, Wiktor Zborowski and Jakub Gierszal. Polish with English subtitles. 128min (2017). Game Of Checkers (Portugal), drama, directed by Patrícia Sequeira and starring Ana Nave, Ana Padrão, Fátima Belo, Maria João Luís and Rita Blanco. Portuguese with English subtitles. 87min (2016). Zip & Zap and the Captain’s Island (Spain), drama (children’s adventure), directed by Oskar Santos and starring Elena Anaya, Carolina Lapausa, Teo Planell, Tom Wilton, and Toni Gómez. Spanish with English subtitles. 105min: PG 8+ (2016). Bookings open on 7 April 2017, with tickets priced at R64. 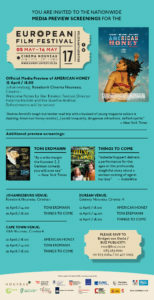 For booking information, visit www.cinemanouveau.co.za or www.sterkinekor.com. For queries, contact Ticketline on 0861 Movies (668 437). Normal benefits and ticket discounts apply to members of SK Club, Discovery Vitality and Edgars Club. Welcome Notes by Ster Kinekor, Festival Director Katarina Hedrén and the Goethe-Institut. Refreshments will be served. Actress-come-director Maria Schrader’s second feature film recounts the last years of Austrian novelist and playwright, Stefan Zweig’s life, which he spent exiled in the Americas, away from the war together with his wife. The agony of being uprooted is as present in the ailing author’s life as the abhorrence of meaningless counter-gestures and the sense of powerlessness in the face of fascism. On a state visit to Turkey, the dutiful but uninspired King Nicolas the 3rd of Belgium learns of a coup back home (the Walloons have declared themselves fed up and independent). Prevented to go back by air, but filled with a renewed sense of purpose, the king embarks on an unorthodox road trip through the Balkans, accompanied by his reluctant aides and led by a resourceful British documentary filmmaker, initially commissioned to improve the dull monarch’s image. This thoughtful and hilarious drama was awarded by the Circle of Dutch Film Journalists at Rotterdam International Film Festival and has screened at Venice and Hamburg Film Festivals. Three love stories, unfolding in two Balkan villages over three consecutive decades – in 1991, 2001 and 2011 – and featuring the same key cast, capture the moods of each time – from the initial sense of doom, via the determination to survive and rebuild, to the dream of leaving the past behind though wounds are still festering. Skillful writing coupled with stellar direction and performances has seen The High Sun and Matanic win numerous awards, among them, Un Certain Regard Jury Prize at Cannes (2015), The International Confederation of Art Cinemas at Sarajevo Film Festival (2015), Best Artistic Contribution at Cairo International Film Festival (2015) and the Slovenian Art Cinema Network’s award for Best Film (2015). Things to Come has screened at numerous film festivals and won Hansen-Love the Silver Bear for Best Director at Berlin International Film Festival 2016. Isabelle Huppert’s performance won her several awards for Best Actress, incl. The New York Film Critics Circle’s and the Los Angeles Film Critics Associations’. Toni Erdmann was Germany’s submission for the 2017 Oscars for Best Foreign Language Film, and until the very end, a highly touted winner. Among its numerous and prestigious nominations and awards are nominations for the Golden Globes and the BAFTAs (2017), the FIPRESCI prize at Cannes 2016, the German Film Critics Association Awards for Best Film, Best Screenplay and Best Edit and several International Cinephile Society Awards. Horgan’s heartfelt documentary tells about the life and activism of Irish drag queen Pandora Panti Bliss. Born in Ireland in the late 1960s and instrumental in revolutionizing the Irish LGBT-scene, the charismatic, sharp and outspoken performer Rory O’Neill almost seems destined to play an influential role at the time of the 2015 Irish referendum for marriage equality rights. The film traces Panti’s spectacular career, public controversies as well as more personal aspects of Rory O’Neill’s life. The Queen of Ireland has screened at film festival across the world and won awards for Best Film and Best Documentary presented by Dublin Film Critics Circle. The course of celebrated Italian author and journalist Massimo Gramellini’s entire life changes on the day his mother dies. Sheltered by his well-meaning but distant father, the 9-year old is left to deal with the void as best as he can. Partly in denial and partly kept in the dark, Massimo grows up in a rapidly changing Italy. Though his professional star is fast rising, he remains stuck emotionally until the day he is asked to reply to the letter of a newspaper reader in distress. Based on Gramellini’s autobiography, this cinematic gem opened the Directors Fortnight at Cannes 2016 and won the International Cinephile Society’s Award for best film not released in 2017. When seven young men became Madonna’s backup dancers for her legendary Blond Ambition world tour in 1990, their lives changed. The mythical documentary Truth or Dare – shot as they traveled the world – contributed to cement Madonna’s status as an icon and one of that time’s most prominent voices for gay rights and AIDS-prevention. The cost for the superstar’s outspokenness and daring image was paid by those who returned to normal life once the dream was over. Dutch documentarians, Gould and Zwaan, give voice to these men. Strike a Pose has screened at Tribeca Film Festival and Hot Docs. It won the Jury Award for Best LGBT-film at the Key West Film Festival (2016) and was the runner-up for the Panorama Audience Award at Berlin International Film Festival (2016). With a career, spanning over continents, three-times Oscar-nominated director Agnieszka Holland returns with a fresh film, based on a novel, which she calls ‘a fairytale about anger’ and which competed for the Golden Bear at Berlin International Film Festival (2017). Five close friends gather after the passing of their common friend Martha, at a tourist resort that the deceased was about to open. The group spends the entire night after Martha’s wake reminiscing, eating, drinking, smoking, opening up old wounds, and revealing secrets, in addition to alternately forgiving and judging one another. When the morning comes, the question of the women’s future friendship remains open. Experienced TV-director Patrícia Sequeira’s first feature has won several awards, incl. Los Angeles Movie Awards for Best Narrative Feature, Best International Film and Best Actress (2016) and Cyprus International Film Festival’s awards for Best Director, Best Leading Actress and Best Script in a First Feature (2016). When the unruly brothers Zip and Zap commit an offense out of the ordinary, they are sentenced to a boring family boat trip with their parents. At least that is what it seems like. Stranded at a remote and mysterious island after a storm, they are invited to stay with Miss Pam, whose home is a children’s paradise with no rules. At first pleased, their parents’ sudden disappearance begins to bother Zip and Zap, who set out to find them together with their newfound friends Flecky and Macky. The visually stunning second feature film about comic book heroes Zip and Zap has screened at BFI London Film Festival (2016) as well as Miami Film Festival and the Audi Dublin International Film Festival in 2017. Acclaimed British director Andrea Arnold returns with a road-movie set in the US Midwest. The film tells of drifting teenager Star who joins a crew of wayward magazine-selling youth led by the uncompromising Krystal (played by Elvis Presley’s granddaughter Riley Keough). Under the guidance of the slightly older and seductive Jake, the strong-minded Star is expected to master the art of selling magazine subscriptions needed by nobody to anybody – rich or poor – using whatever capacities at hand. Among its achievements are the Jury Prize at Cannes (2016), the FIPRESCI Prize at Stockholm Film Festival (2016) as well as awards for Best Independent Film, Best Director, Best Actress and Outstanding Achievement in Craft for cinematography at the British Independent Film Awards (2016). It was nominated for a BAFTA for Outstanding British Film of the Year.